I’ve been wanting an inexpensive flashlight to use at work. Something about using my Streamlight ProTac HL that cost $100, and takes $10 worth of batteries in an environment where it could get lost or stolen doesn’t sit right with me. I knew that I had this old 2AA Coleman LED flashlight kicking around the house, and it’s always been a great light, especially for the $20 I paid for it a few years back. The only downside is that it doesn’t have a pocket clip for carry. It’s just short enough that pocket carrying it without a clip will allow it to fall over in my pocket, but it’s long enough that once it does fall over, it’s awkward in the pocket, so it needed a clip. I robbed the clip off of an old CRKT pocket knife that I never use. I planned to take pictures of the process, but I found myself in tinker mode, and forgot to take them, but it’s pretty straightforward. Remove the clip from the knife, and line it up on the flashlight where I wanted it. I found easiest to take some masking tape to hold the clip in place so I could mark where I would be drilling the holes. Mark the holes. Being that the flashlight is made of fairly soft aluminum I just tightened it into my bench vise, and carefully marked the holes with a center punch and a hammer. Drill the holes. I started the holes with the smallest drill bit I had for a pilot hole, then moved up to the correct size for the screws (I used a bit the same size as the center shank of the screw, minus the threads). Tap threads into the holes. Admittedly this is the part where things got a little janky. I don’t have a set of taps, but being that the screws are good hard steel and the flashlight is soft aluminum I decided to go for it. I took one of the three screws and made two cuts with a cutting wheel on my dremel from the end of the threads up to the middle of the screw to act as a makeshift tap. Tap the threads. I hate screws that accept hex keys with a passion. I always find a hex key that seems to fit then when I put a little torque on it the hex key spins in the screw and rounds out the hole. In an attempt to avoid this, I took the makeshift tap/screw and chucked it into a set of vise-grips and carefully turned it into the holes, backing it in and out to clear the shavings from the inside of the holes. Surprisingly this process went smoothly, and the threads looked better than expected. Screw on the clip. After the holes were tapped I added the clip, and ran in the two screws that weren’t modified first, after adding a good bit of loctite to them, just in case. The third screw was the one I modified, and I placed it in the center screw hole of the clip. It was a little too long so I trimmed the tap portion off the screw with my dremel so the batteries would have room to drop into the light. If I had a good set of taps, I would have used them to tap the threads into the flashlight, but my homemade tap seemed to work just fine in the soft aluminum. We’ll see how she holds up. It’s always fun the breath some new life into a piece of gear that’s went unused for a lone period of time. I’ve had this light for several years, but I rarely use it because it’s hard to carry. Hopefully this free mod will allow me to get a lot more service out of this surprisingly nice, inexpensive flashlight. 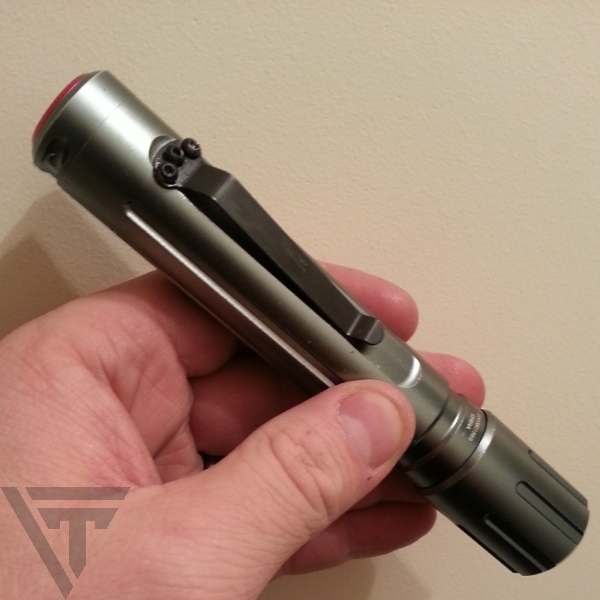 Have you tried molding Kydex into a clip onto the light instead? While reading your article the idea came to me that you could cut out a T shaped piece of kydex and then molded it to the light. Then heat with a heat gun and make the clip a tad smaller so it would hold tight and the bend out and back the pocket clip. Just an idea. Nah, even the thickest kydex doesn’t have the strength to work well in that sort of situation. I did consider it though.